Contacted in the Fall a few years ago by Chris B. regarding a remodeling project of their Kitchen and adjoining Family Room in New Jersey. Chris and his wife were not sure what species of flooring they wanted for their project. They wanted something similar to cherry in color but wanted something more dense so that the floor would stand up to the effects of kitchen and family room traffic. We suggested several options, primarily from South America as those wood species were very dense and we knew that one of them would satisfy the durability, grain and color they desired. Pictures of Amendoim Flooring were emailed, and Chris and his wife decided to order some samples of that product so they could see it up close and do a stain test on the flooring before making a final decision. The samples arrived and they did the stain test which they were very pleased with. Chris called and placed the order for 600 square feet of the 4” Amendoim shortly after that. They also needed about 19 feet of custom fabricated landing tread with bullnose for a step down from their kitchen into the family room. In addition to the material Chris needed extra services with the delivery. We were able to provide residential lifgtate and unloading service into their garage so that the lumber would not be exposed to the elements. REALGOODS Company managed the fabrication of the flooring, the custom bullnose and the extra services from the freight company to make sure the customer was well served. “Customer service was totally top shelf. I spoke with Dan Wheeler who is not only very knowledgeable about his product but was very patient in dealing with what felt like an infinite amount of questions and ideas. I sub contracted out my Kitchen and Dan was instrumental in helping me find the right kind of wood floor for my particular needs. (Amendiom) a wood I would have overlooked and yet it was simply gorgeous as well as having a hardness rating better than the walnut or oak that I wanted. Not to mention how much richer it looks. And wow am I a happy Camper. 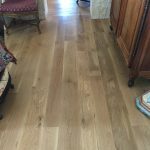 Thanks Dan for all your help and great advice.” Chris B.
Amendoim Flooring originates from South America, also known as Brazilian Oak, is a great choice of exotic hardwoods. Amendoim has distinctive variance within its coloring, ranging from light to medium golden-brownish tones. With Amendoim’s beautiful natural coloring and high hardness, it excels in high traffic areas such as kitchens while retaining the natural ability of light colored hardwoods of hiding wear and tear. Amendoim Flooring provides a warm appearance and great contrast for dark or white woodwork. Amendoims Heartwood is a light to medium reddish brown, sometimes with darker stripes. Color tends to darken with age. Pale yellowish brown sapwood isn’t always clearly distinguished from heartwood. Overall appearance is very similar to Mahogany, with the Grain being straight to interlocked, with a medium texture and a high natural luster.